While Shuttle Program managers continue their review of potential launch dates for the final two shuttle missions, preparations on Discovery for what is currently her final flight are well underway at the Kennedy Space Center, with the Launch Site Flow Review (LSFR) for the STS-133/ULF5 mission outlining the modifications to be made to Discovery during her time in Orbiter Processing Facility Bay 3. Among the already approved and in progress modifications to Discovery, two “Mission Kit Modifications” are waiting to be baselined at the Delta LSFR for implementation on OV-103. For the Dragon Eye DTO, “STS-133 FRD, Dragon Eye will replace TriDAR DTO on OV-103,” notes the LSFR presentation – available for download on L2. The Dragon Eye DTO will mount to the same location on the external Airlock truss of Discovery as the TriDAR DTO did on STS-128 and STS-131. The installation tech order is scheduled to be “manifested on STS-133 MECSLSI.” The hardware for the Dragon Eye will be Government Flown Equipment (GFE) with a “go” for installation date by July 14. 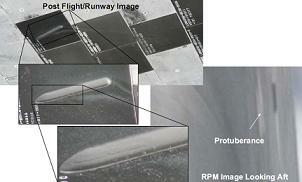 Additionally, PRSD tank set 5 is scheduled to be removed for Ascent Performance Margin (APM) requirements. Originally, this removal included the inadvertent inclusion of the removal of an air duct that is used to support tank sets 3 and 5. Moreover, the LSFR notes several (5 total) potential modifications to Discovery that could be implemented pending approval and processing flow time constraints. The first potential modification includes an increase to the Boundary Layer Transition (BLT) DTO (Detailed Test Objective) protuberance tile. “Re-flight of protuberance tile and associated thermocouple installation with likely protuberance height increase to 0.50-inches,” notes the LSFR document. A thermal analysis conducted on May 10 found no issues with a protuberance tile height of 0.50-inches. Nonetheless, “Protuberance tiles with height options of 0.35″, 0.45″ and 0.50″ are being fabricated – engineering release for chosen option to be released by June 11 in support of GO implementation schedule,” notes the LSFR presentation. A baseline of the BLT DTO tile height is scheduled for the Program Requirements Control Board (PRCB)/Delta PRCB on June 10. In line with the BLT DTO, consideration is also being given to a re-flight of the catalytic coating DTO (3rd flight total) on a downstream BLT DTO TPS (Thermal Protection System) tile. If a re-flight is approved, there would be no configuration change to the catalytic coating DTO from Discovery’s previous flight; therefore, no modification would need to be baselined. 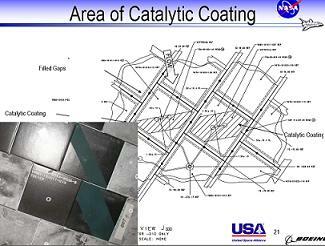 The only forward work necessary would be the removal and replacement of the STS-131 catalytic coating tile. Switching gears, the third potential modification relates to the Ceramic Insert Plugs what have been seen to liberate on recent missions. 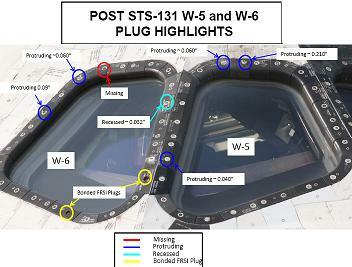 “TPS PRT recommendation for corrective actions related to ceramic insert plug loss / protrusion as seen on STS-131,” notes the presentation. This modification would be fleet wide. Also on tap for potential implementation on Discovery for STS-133 is the inclusion of Port and Starboard WLE (Wing Leading Edge) reference marks. “Imagery has determined the docked OBSS (Orbiter Boom Sensor System) LDRI (Laser Dynamic Range Imager) inspection involves different trajectories from the nominal OBSS survey, due to ISS hardware considerations. 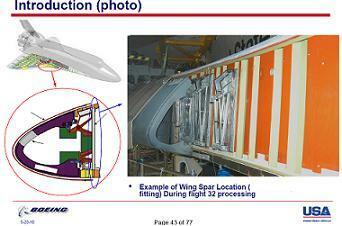 The LSFR presentation notes that the flight-specific pause points for the various views of the WLE surfaces are “fairly nondescript.” As a result, a recommendation has been brought forward to add “position identifying symbols” on both the port and starboard WLE RCC (Reinforced Carbon-Carbon) panels. 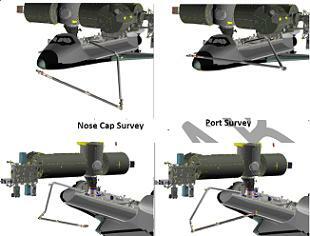 These reference marks, if approved, will be applied to the WLE RCC panels with an “approved black Sharpie” in a manner similar to the already sharpie-applied reference marks on the nose cap RCC of all three orbiters. A Change Request for this modification will be processed “at a later date” and will be similar to the Change Request processed for STS-134 on Endeavour. With the potential modifications to Discovery reviewed, the LSFR document goes on to discuss three (3) opportunity modifications that have already been presented to and approved by the PRCB and are simply waiting for enough time in an OPF flow to be brought to completion. This modification is nearly complete thanks to work done on previous OPF flows. Currently, only LH RCC panels 2-4 (3 out of 44 RCC panels total) have not had this modification applied. The second opportunity modification is a redesign of the lower WLE Carrier Panel Horse Collar Gap Filler. “Redesigns the lower WLE access carrier panel horse collar gap fillers with an enhanced design with additional sleeving,” notes the LSFR presentation. As with the WLE Spar “Sneak Flow” protection, this modification is nearly complete save LH RCC panels 2-4. The final opportunity modification is a Connector Saver (ME414-0630) Redesign for the LH OMS Pod and Ku Band antenna. Again this work is nearly complete thanks to previous OPF flows and only the Left OMS Pod and Ku Band locations remain.